Our styling is high end not our prices. You can expect a superior cut, reasonable prices, and an experience that will leave you feeling fantastic every time. Aro Hair Studio provides a personalised service that ensures top quality styling. We are conveinently located at 93 Aro Street. Since 2000, we’ve developed a clientele that values our dedication to a personalised salon experience in a warm and relaxing environment. If you’re looking for a boutique salon that provides you with top quality styling with a personalised touch, you’ve come to the right place. Check out our list of services here and make a web booking here or give us a call. We provide a boutique salon service convienently located at 93 Aro Street, Aro Valley, Wellington with easy parking nearby. For our Price List click here. At Aro Hair Studio, we've been in business for 15 years and we pride ourselves on delivering a personalised salon service to clients. 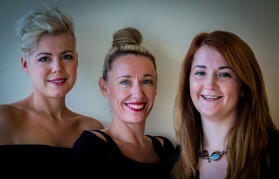 If you need a fantastic look our stylists excel in the creation of the look to suit you! The credentials of each stylist ensure you get a superior result. Ready for the Aro Hair experience? Give us a call on 04 382 8782, or make a web booking here with one of our stylists. "I've had a 10 year relationship with Aro Hair and always feel like I'm treated like family." "My stylist at Aro Hair always makes sure my style works for me, not for her."